Ring sizing can be confusing; if you’re struggling to find the perfect fit and you don’t know how to measure your ring size, this is our ring sizing guide complete with measuring instructions, sizing chart, and tips for measuring your ring size whether it’s for your wedding ring or an everyday stacking ring. 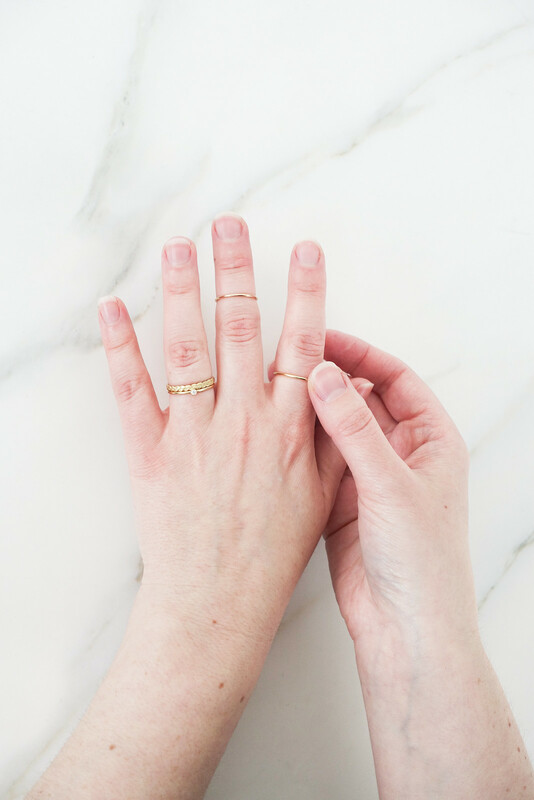 These are our pro-tips for measuring your ring size and we recommend you read them before measuring your fingers; they'll help you achieve the most accurate measurement to find your perfect ring. Your ring should go on easy and be difficult to take off to lessen the chances of losing it. Don’t force the ring onto your finger though or it might get stuck. When measuring, pull the ring sizer so it fits snugly against your finger. Delicate rings will fit more loosely while larger rings will be tighter fitting. For delicate minimal stacking rings, pick your true size; for larger bands you may need to size up. Measure your ring size only when your fingers are warm and towards the end of the day. Avoid measuring your fingers when they are especially cold or hot as you won’t get an accurate measurement. Your finger size changes for all kinds of reasons and you may find a loose band becomes noticeably tighter and a snug band becomes looser. This change can be especially noticeable during summer and winter. Bear that in mind when choosing your ring size. Sizing is tricky and guessing won’t find you the perfect fit. The easiest way to measure your ring size is with a ring sizer. 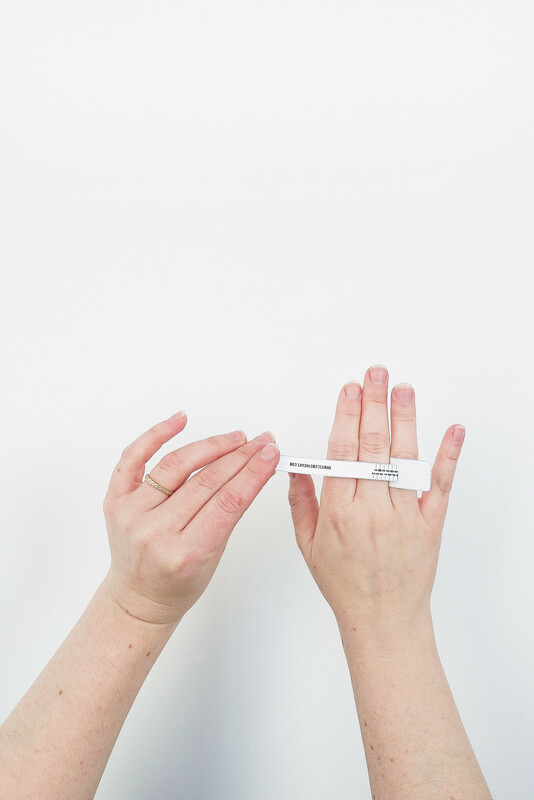 Using our printable ring sizer, you can measure whichever finger you want to wear a ring including your perfect midi-ring size. Download our ring sizer and print at 100% making sure you do not scale the page. To check the scale is accurate, measure the marked line with a ruler. Cut out the ring sizer using the dotted lines and create a slit in the band. To measure your ring size, wrap the ring sizer around the finger you want to measure and slip the strap into the slit you cut to get a snug fit. Use the guide to find out your ring size. 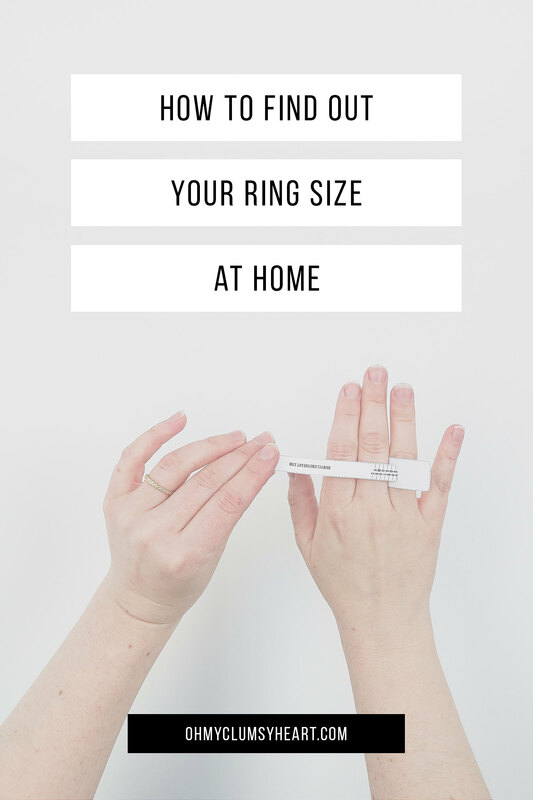 Our ring sizer measures in British finger sizes but the below chart will help you find out your international ring size. send us an email, we're here to help!